"RISC-V (pronounced "risk-five") is an open-source hardware instruction set architecture (ISA) based on established reduced instruction set computer (RISC) principles. In contrast to most ISAs, the RISC-V ISA is free and open-source and can be used royalty-free for any purpose, permitting anyone to design, manufacture and sell RISC-V chips and software. While not the first open-architecture ISA, it is significant because it is designed to be useful in a wide range of devices. The instruction set also has a substantial body of supporting software, which avoids a usual weakness of new instruction sets. The project began in 2010 at the University of California, Berkeley, but many contributors are volunteers and industry workers outside the university. 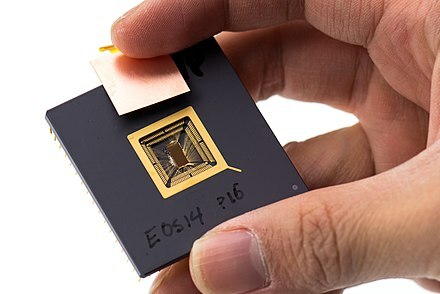 The RISC-V ISA has been designed with small, fast, and low-power real-world implementations in mind, but without over-architecting for a particular microarchitecture style"
"Amazon Web Services comprised just 11% of the company's overall sales in 2018, but delivered more operating income than all other business units combined. In financial results delivered Thursday, Amazon Web Services Inc. drove $7.43 billion sales for the quarter ending December 31, up 45% from $5.11 billion year-over-year. (See Amazon Reports Q4 Sales Up 20% to $72.4B.)" "RN Fabric allows the UI thread (where UI is drawn) to be in sync with the JS thread (where the UI is programmed)"
As of Postgres 9.4, along with the JSONB data type came GIN (Generalized Inverted Index) indexes. With GIN indexes, we can quickly query data using the JSON operators @>, ?, ?&, and ? 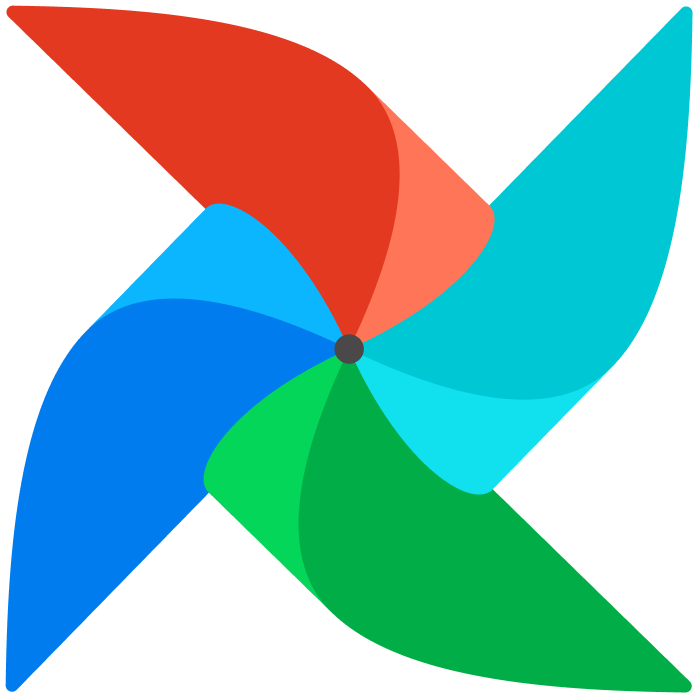 Fission maintains a pool of "warm" containers that each contain a small dynamic loader. When a function is first called, i.e. "cold-started", a running container is chosen and the function is loaded. This pool is what makes Fission fast: cold-start latencies are typically about 100msec. Deploy functions instantly with one command. There are no containers to build, and no Docker registries to manage." "Business process management software primarily serves the purpose of providing a platform for people to design, build, analyze, modify and the test the various business processes." "When using Amazon SWF, you implement workers to perform tasks. These workers can run either on cloud infrastructure, such as Amazon Elastic Compute Cloud (Amazon EC2), or on your own premises. You can create tasks that are long-running, or that may fail, time out, or require restarts—or that may complete with varying throughput and latency. Amazon SWF stores tasks and assigns them to workers when they are ready, tracks their progress, and maintains their state, including details on their completion. To coordinate tasks, you write a program that gets the latest state of each task from Amazon SWF and uses it to initiate subsequent tasks. Amazon SWF maintains an application's execution state durably so that the application is resilient to failures in individual components. With Amazon SWF, you can implement, deploy, scale, and modify these application components independently." SWF does not execute any code. SWF does not contain the logic of the workflow. SWF is based on polling. Your code runs on your machines on AWS or on-premises – it doesn’t matter. Your code is polling for tasks from the SWF API (where they wait in queues), receives a task, executes it, and sends the result back to the SWF API. SWF then issues new tasks to your code, and keeps the history of the workflow (state)." AWS Step Functions lets you coordinate multiple AWS services into serverless workflows so you can build and update apps quickly. Using Step Functions, you can design and run workflows that stitch together services such as AWS Lambda and Amazon ECS into feature-rich applications. Workflows are made up of a series of steps, with the output of one step acting as input into the next. Application development is simpler and more intuitive using Step Functions, because it translates your workflow into a state machine diagram that is easy to understand, easy to explain to others, and easy to change. You can monitor each step of execution as it happens, which means you can identify and fix problems quickly. 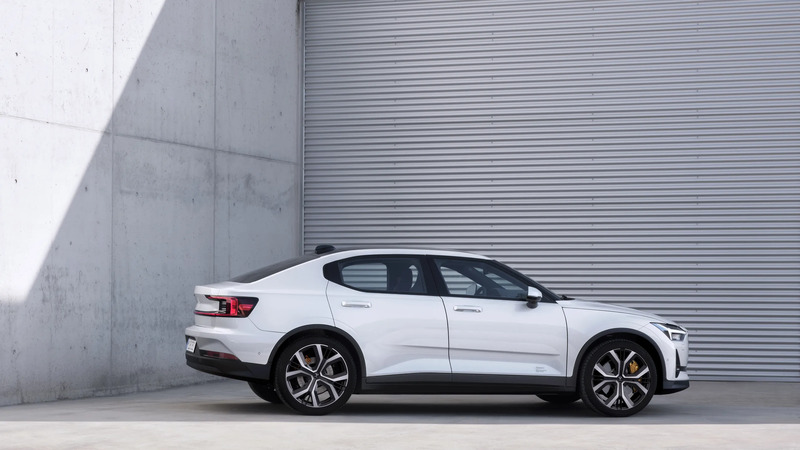 Step Functions automatically triggers and tracks each step, and retries when there are errors, so your application executes in order and as expected." "You should consider using AWS Step Functions for all your new applications, since it provides a more productive and agile approach to coordinating application components using visual workflows. If you require external signals to intervene in your processes, or you would like to launch child processes that return a result to a parent, then you should consider Amazon Simple Workflow Service (Amazon SWF). With Amazon SWF, instead of writing state machines in declarative JSON, you write a decider program to separate activity steps from decision steps. This provides you complete control over your orchestration logic, but increases the complexity of developing applications. You may write decider programs in the programming language of your choice, or you may use the Flow framework to use programming constructs that structure asynchronous interactions for you." "You can now use a local version of AWS Step Functions to develop and test your workflows." "Microsoft Flow and Logic Apps are both designer-first integration services that can create workflows. Both services integrate with various SaaS and enterprise applications. 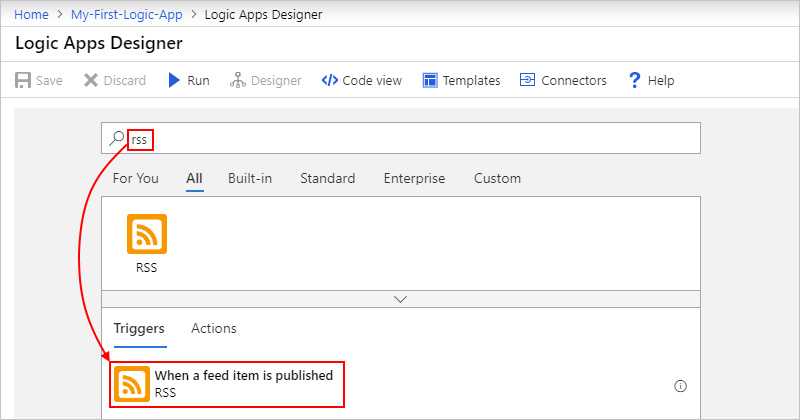 Microsoft Flow is built on top of Logic Apps. They share the same workflow designer and the same connectors." "Functions and Logic Apps are Azure services that enable serverless workloads. Azure Functions is a serverless compute service, whereas Azure Logic Apps provides serverless workflows. Both can create complex orchestrations. An orchestration is a collection of functions or steps, called actions in Logic Apps, that are executed to accomplish a complex task. For example, to process a batch of orders, you might execute many instances of a function in parallel, wait for all instances to finish, and then execute a function that computes a result on the aggregate." 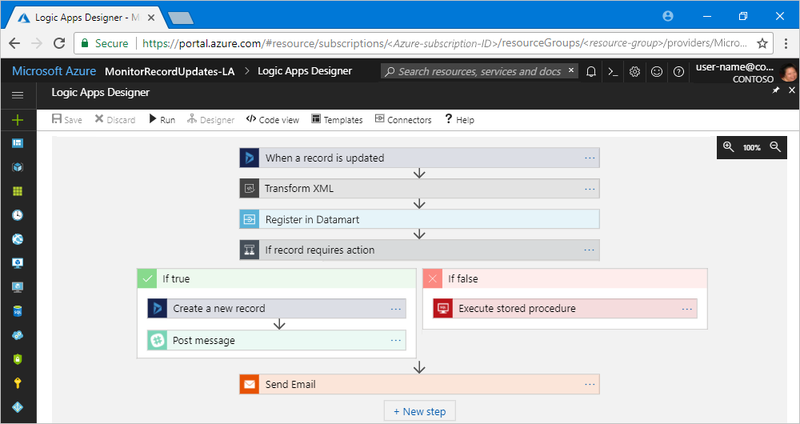 "Azure Logic Apps is a cloud service that helps you automate and orchestrate tasks, business processes, and workflows when you need to integrate apps, data, systems, and services across enterprises or organizations. Logic Apps simplifies how you design and build scalable solutions for app integration, data integration, system integration, enterprise application integration (EAI), and business-to-business (B2B) communication, whether in the cloud, on premises, or both. To build enterprise integration solutions with Azure Logic Apps, you can choose from a growing gallery with 200+ connectors, which include services such as Azure Service Bus, Functions, and Storage; SQL, Office 365, Dynamics, Salesforce, BizTalk, SAP, Oracle DB, file shares, and more. Connectors provide triggers, actions, or both for creating logic apps that securely access and process data in real time." "Every logic app workflow starts with a trigger, which fires when a specific event happens, or when new available data meets specific criteria. Many triggers include basic scheduling capabilities so that you can specify how regularly your workloads run. For more custom scheduling scenarios, start your workflows with the Schedule trigger. Learn more about how to build schedule-based workflows. Each time that the trigger fires, the Logic Apps engine creates a logic app instance that runs the actions in the workflow. These actions can also include data conversions and flow controls, such as conditional statements, switch statements, loops, and branching." Workflow – is used to define the different steps of your business process, using a graphical user interface. Poll triggers: These triggers poll your service at a specified frequency to check for new data. When new data is available, a new instance of your logicapp runs with the data as input. Push triggers: (Webhooks) These triggers listen for data on an endpoint, or for an event to happen, then triggers a new instance of your logicapp. Recurrence trigger: This trigger instantiates an instance of your logicapp on a prescribed schedule. Actions - An action represents a step in the workflow. It can invoke an operation on your API. Connectors - are used to connect to different data sources and services. 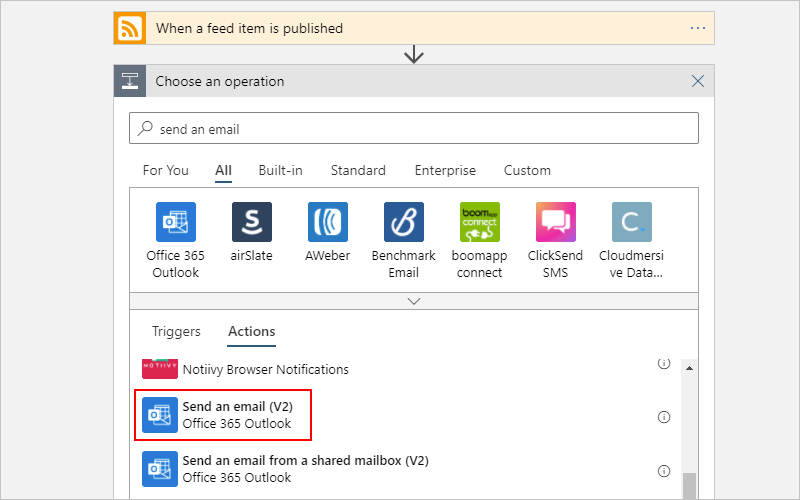 Azure LogicApps provide an in-built set of managed connectors that cover different areas like social media, file FTP and many more. Enterprise Integration Pack (EIP) Connectors - provide functionality like BizTalk. "Actions": building blocks of Logic Apps; most of Actions are also Connectors. Actions is just "next step" in a logic app. 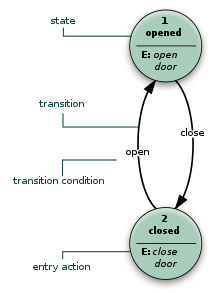 "if-then", "switch", "for-each", "do-until", "scope"
(Finite) State Machine is based on "events" that cause transitions between states. Usually there is a nice graphical presentation of such states and events. When systems get more complex there are "state-charts" with some useful tools to help. "In a workflow engine, transition to the next step occurs when a previous action is completed, whilst a state machine needs an external event that will cause branching to the next activity." Workflows and state transitions can be defined as meta-data (i.e. JSON or XML files), and tools can dynamically generate GUI and process events. Workflows are also essential part of "Business Process Modelling" (BPM). (Business process management) "enterprise" tools. "a statechart is a beefed up state machine. The beefing up solves a lot of the problems that state machines have, especially state explosion that happens as state machines grow"
The machine is defined by a finite list of states. One state is defined as the initial state. When a machine is “started” it automatically enters this state. States can define “events” that trigger a transition. A transition causes the machine to exit the state and enter another (or the same) state. A transition may be conditional, in other words might ask “the world” about things. These are called guards and must be side-effect free. A state can define actions upon entering or exiting a state. These are called actions and will typically have side effects." davidkpiano/xstate: State machines and statecharts for the modern web. "A state machine abstraction for React that provides declarative state management and automatic test generation." "The main problem that’s stopping widespread usage of state machines is the fact that beyond very simple examples, state machines often end up with a large number of states, a lot of them with identical transitions.
" Statecharts solve this state explosion problem:"
In statecharts, states can be organized hierarchically. A guard is a sort of pre condition to a transition, in a way it stops a transition from happening if some condition is not true.